You are invited to a potluck to be held on Sunday August 26th, 2018 starting at 11:00 am to be held at our clubhouse. This event is open to all members and their families. The club will be supplying hot dogs with all of the fixings and potato salad. All are cordially invited. Please bring something to share. 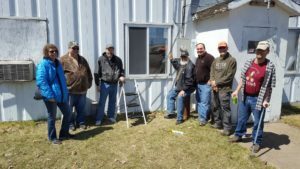 Welcome to the 2018 Saint Cloud Amateur Radio Club Anniversary QSO Party. This contest helps us all be prepared in a number of ways, gets to know one another, allow for some friendly competition and try out our emergency preparedness skills. Since this contest is limited to the 2M FM band, it does not require any fancy equipment and all can participate. The contest is just a short 2 hour time frame. To make as many contacts as possible, encouraging the use of 2M simplex mode, and to have fun! Now is the time to get your Amateur Radio License, or upgrade to a higher level. The St. Cloud Amateur Radio Club is hosting an Exam Session to do just that.